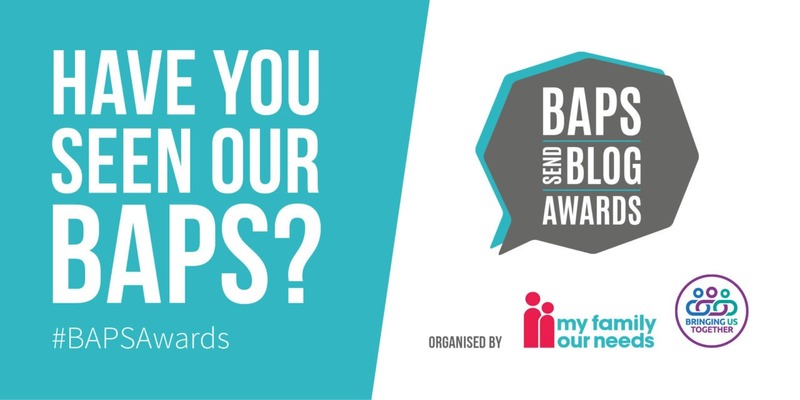 Nominations for the 2019 BAPS SEND blog awards have been announced. Have you seen our BAPS? The Bloody Awesome Parent SEND blog awards. Long-list nominations for this year’s categories in the 2019 BAPS Awards are out. Did you make the list? Was your favourite blogger on there? Check out who was nominated. Best Newcomer: Those blogs that are less than a year old. Blogger Making a Difference: Who is out there influencing change? Blog Post That Made the Biggest Impact: Which post made you stop and think? Best use of Media: Bloggers who use Facebook or Instagram as their main platform. Bloody Awesome Parent of the year (Non Blogger): Someone who doesn’t blog but deserves recognition for what they are doing or have done. We are extremely excited to see that PDA (pathological demand avoidance) bloggers feature so heavily in these categories as well as Campaigning for change bloggers who are paving the way for the disabled community. The nominations this year represent the robust and unstoppable SEND community, these bloggers write with purpose whether they are campaigning for changing places, pushing for inclusivity or ensuring that accessibility is on everyone’s agenda. The nominees are currently with our lovely judges, who are working hard to whittle them down to a top four in each category. Those lucky four will then be put to the public vote when Round 2 opens on 18th February. This year, our judges who include Choice Support’s Chief Executive, Sarah Maguire and Dimensions Head of Public Affairs, Alicia Wood, will be joined by actress and disability campaigner, Samantha Renke. Whether you’re nominated, shortlisted or just love the bloggers – you can join us for the Awards Ceremony on 16th May at the Windmill Village Golf Club & Spa in Coventry. This year, we have the lovely Carrie Grant as our host. Entry to the BAPS Awards. A Chance to Meet our host. Get involved and get your company recognised for all the right reasons. If you support disabled people, then this is the perfect opportunity to shout about the great work you do. In 2018, our sponsors benefited from online exposure following +14,000 nominations and votes. Their logos were displayed on pages which received +75,000 views and they celebrated a fantastic night with people who could benefit from their services.